01. 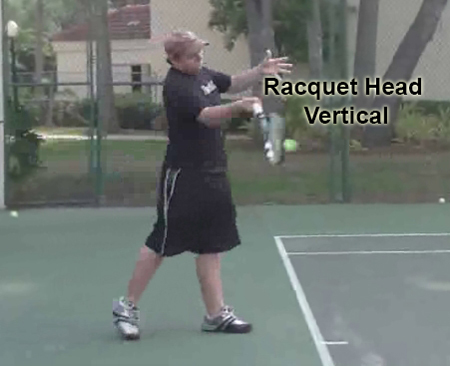 Racquet Face is Vertical – This is required when attempting to hit topspin. Should happen automatically when the racquet swings forward. 02. 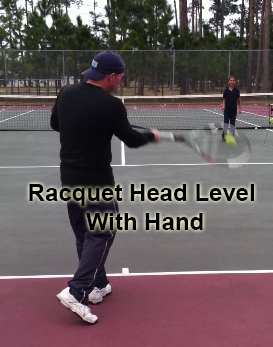 Racquet Head About Level With Hand – This helps facilitate a stable racquet head which makes off-centered shots more likely to still be good. Also makes it less likely to move the wrist before contact. 03. 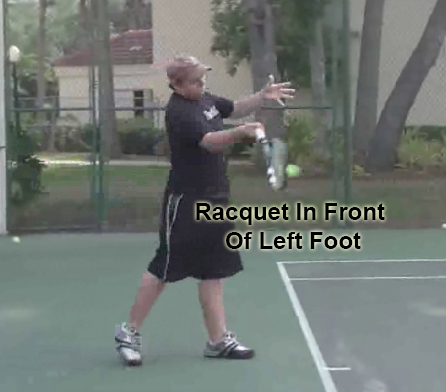 Racquet In Front Of Left Foot – For an eastern or more extreme grip. The more extreme the grip, the further in front of the left foot the racquet should be. 04. 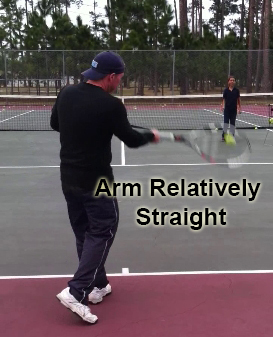 Hitting Arm Relatively Straight – This gives a faster moving racquet head at the contact point due to the increased swing radius. 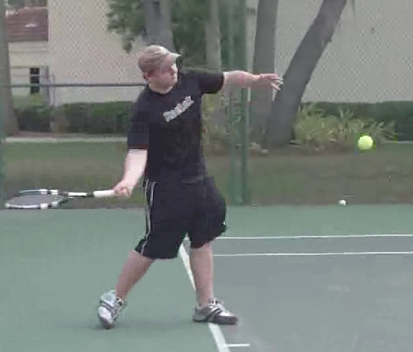 A faster moving racquet head makes for a more powerful overall shot. 05. 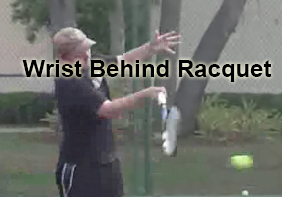 Wrist is Behind Racquet – Still has 30 degree bend to it and is locked. 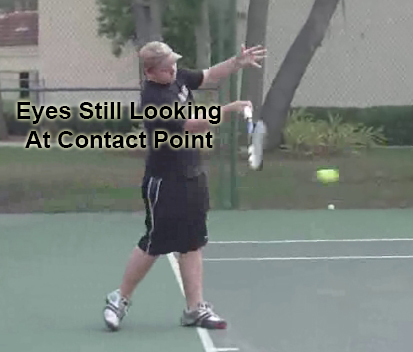 This helps stabilize the racquet and helps to keep the contact point out in front of the body. 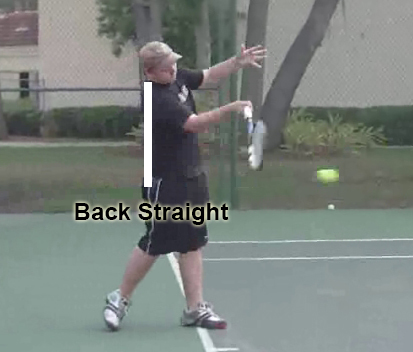 A more stabilized racquet leads to greater consistency and a racquet in front of the body gives a more powerful shot. 06. Belly Button Pointing Towards Net Post – This signifies the deceleration of the shoulders and hips which accelerates the hitting arm and racquet. This adds a tremendous amount of power to the shot. 07. 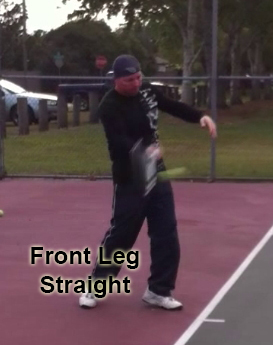 Front Leg Relatively Straight – Helps to transfer power to the arm and racquet giving a more powerful overall shot. The back leg can still be bent. 08. Left Foot Toes Towards Net Post – Makes it easier to move the leg and knee especially on the follow through. 09. Weight Mostly On Front Foot – This means the weight has transferred from the back foot to the front foot. The weight transferring increases power. 10. 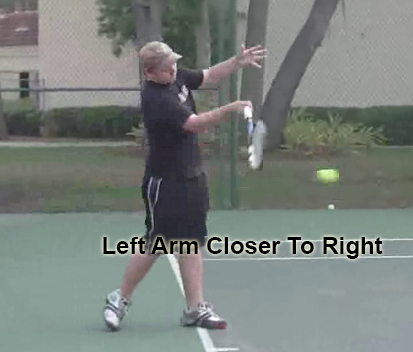 Left Arm Decelerated and Closer to Right Arm – The left arm will look like it is not moving. It is still moving, but its moving really slow in relation to the rest of the body. Hover over below image to see the left arm closer to the right at the contact point. 11. Back Straight – Keeps the bodies center of gravity centered which helps the body maintain balance. Also less stressful on the body. 12. Head Stays Still – The head is the heaviest part of the body (density wise) by keeping the head still the rest of the body will stay on the path intended which will lead to cleaner hitting which will add consistency.